No matter what it’s called, it’s the usual lies, untruths, narratives, backtracks, flipflops, clarifications and new information one has to deal with on a daily basis. IF one lives in the USA–ground zero for deception in the end times–then one is SURROUNDED and ENVELOPED by propaganda (deceit). How can one know when the news, an advertisement, entertainment or conversation is propaganda? 1- Propaganda is intended to appeal to one’s emotions or feelings. It attempts to bypass reasoning, thinking and/or logic. In the USA, it usually (but not always) produces feelings of anger, hatred or fear. 2- Propaganda’s message is always a simple one. Such as Aliens from outer space! Threats to the earth from Above! The Bible is a book of bedtime stories! You can trust Science! It is the Truth! Listen to EXPERTS and really super-smart men, like Albert Einstein! 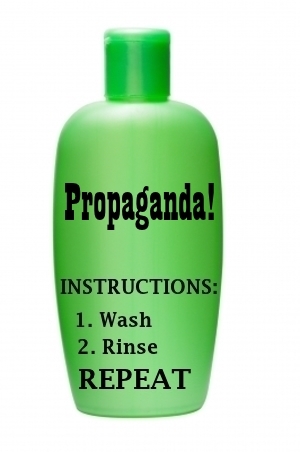 There are so many simple propaganda messages, it would take a book to list them all. BUT, it’s VERY important to keep the message simple. 3- REPEAT the message endlessly. The message cannot be repeated too much. This is the most important rule of propaganda. Slogans such as LESS is MORE. REPEATING the message over and over is the key. EVEN IF YOU TELL A LIE, make sure it’s repeated. This one of the keys to recognizing propaganda: if it’s repeated (on TV, in the news, on the late night talk shows, in the comics, in a crossword puzzle, at the movies, on the radio, at a comedy show); if it’s the NEXT BIG THING and has people talking, it’s being repeated. When the media can’t get enough of of a story and repeat it over and over 24/7, around-the-clock: the reader can be assured he’s being exposed to propaganda. The attempt is being made to manipulate his attitude and/or behavior, now or in the future. REPEAT – REPEAT – REPEAT. These are the A-B-C’s of propaganda. Does the reader recognize when he is being deceived? Does the reader recognize propaganda? IF the answer is “yes,” the time for choosing is growing short. IF the answer is “no,” the time is no less short: no time is bought by unbelief.